Roses have been cultivated for their beauty and fragrance for upwards of 5,000 years, according to University of Illinois Extension. These flowers come in an astonishing array of colors, shapes and sizes, from tinier versions of bush roses to sprawling, climbing flowering plants. Some roses have two or even three colors, while other rose plants are prolific bloomers but have no scent. The sheer size of the Rosa genus makes these plants difficult to formally classify, but some organizations have categorized roses into groups according to their origins. There is no worldwide system in place for classifying roses, according to online resource Every Rose. The most widely accepted system is the one used by the American Rose Society and the World Federation of Roses. In this system, there are three broad classes of roses, each of which can be broken down into more sub-classifications. Roses are sorted into three very large groups, according to Rose Gardening 101--species roses, old-fashioned or garden roses, and modern roses. Species roses are those that are true to the species. They are as nature formed them and they have not been altered or improved. Old-fashioned roses are some of the first cultivated roses. They are hybrids of species native to Europe. Modern roses are usually defined as hybrids developed in the late 1800's. They began as a cross between tea roses (an old-fashioned hybrid) and polyanthus (genus Primula, or primroses), but many have been hybridized many times over. Species roses are thorny, hardy plants that grow with only minimal care. They range from climbers to groundcovers to upright growers. 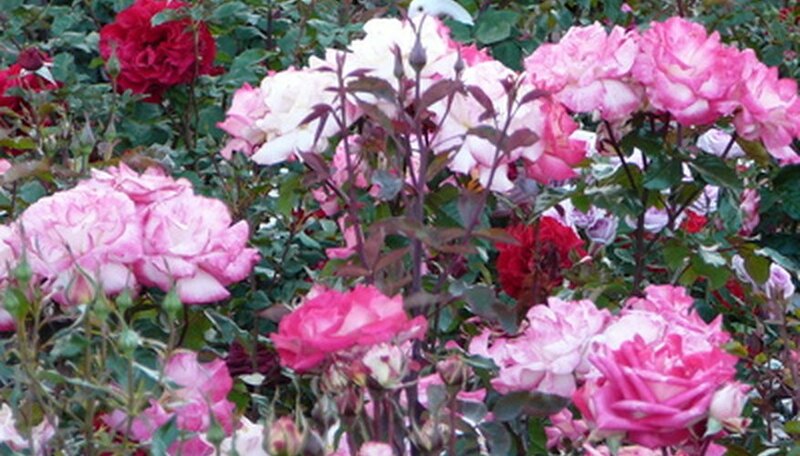 Most species roses feature flowers with only five petals in shades of pink, white and red. Old-fashioned roses are desirable for their cold-hardiness and strong scent, according to the University of Illinois Extension. They often feature large, heavily-ruffled blooms. Modern roses range widely in appearance, from potted miniature roses to long-stemmed beauties. Some have just one bloom, while others feature multiple flowers on one stem. Most are fragrant. Species roses do not have any sub-classifications and are usually grouped according to color or U.S. Department of Agriculture (USDA) plant hardiness zone. There are five classifications of old garden roses. They are: gallica, the oldest Western cultivated roses; damask, which bloom in the spring and are often used for potpourri; moss, which appear "fuzzy;" alba, which can grow up to 8 feet tall; and centifolia, which are often called "cabbage roses" for their many layers of petals. Modern roses are classified as hybrid tea, grandiflora, floribunda, and miniature. Hybrid tea roses are popular for their long stems topped with gorgeous blooms, but they are somewhat fragile plants. Grandiflora and floribunda are prolific bloomers, but most do not have strong scents. Miniature roses are hybrids descended from 'Rouletti,' which is a dwarf rose from China. There are other types of roses that do not fit into the above three classifications, according to University of Illinois Extension. Many commonly sold shrub roses, for example, are often so hybridized that it is impossible to discern the origins of the plant. Some roses are also misnamed. Many climbing roses, for example, do not really "climb" at all, but produce very long canes that must be supported by some type of structure--giving the rose the appearance of climbing.